Shaun Coghlan completed his Bachelor of Science and Masters in Osteopathy at Victoria University. He has a strong passion for Osteopathy, and is very excited to be part of the team at The Osteopaths of Blackburn. Shaun has spent his whole life living in Blackburn and has a strong connection to the local community. Shaun is an avid basketballer. After playing for more than 10 years, including a tour of the USA, he now enjoys a coaching role in both the junior and senior program at the Blackburn Basketball Club. Shaun has also previously worked as a sports trainer at the Whitehorse Football Club and has treated athletes at several other sporting events, including netball and dodgeball. Shaun Coghlan has a keen interest in rehabilitation, and promoting self-health and wellbeing through education and lifestyle changes. He applies a holistic approach to osteopathic treatment and enjoys the challenge of finding the root cause of the issue. 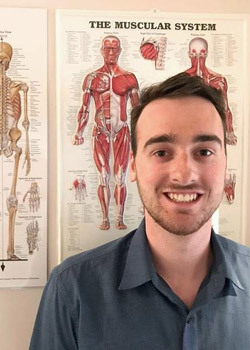 Shaun is also a member of Osteopathy Australia and has undergone extra study in dry needling and cupping. As well as his love for sport, Shaun is fond of the outdoors and spending time with his family and friends. Shaun is very pleased to be a part of the team at The Osteopaths of Blackburn where we offer Osteopathic care to the whole family in a relaxing and caring environment. Please feel free to contact Shaun to discuss whether Osteopathy may be beneficial to you, your family or friends.